The Dornier Do 214 was a large long-range flying boat developed by Dornier in World War II. Originally designed as the Do P.93 for passenger transatlantic service from Lisbon to New York, the Do 214 was redesigned as the P.192 for military service in early 1940. In 1941, a full-sized fuselage mockup was constructed in order to evaluate the interior layout. The fuselage was streamlined and of a round cross-section, with the interior consisting of two decks. Wings featuring a small amount of sweep on the leading edge, with straight trailing edges were shoulder mounted on the fuselage. Eight Daimler-Benz DB 613 24-cylinder double piston engines provided the power, with four tractor engines and four pusher engines. All eight engines provided power to four-blade VDM variable pitch propellers; the front propellers had a 5.00 m (16 ft 5 in) diameter, the rear propellers had a 4.60 m (15 ft 1 in) diameter. The mammoth eight-engine design was intended for use as a military transport, with a large bow door admitting vehicles and bulky freight to the upper deck. It was also designed for use as a long-range bomber, flying tanker, aerial minelayer and U-boat supply vessel. 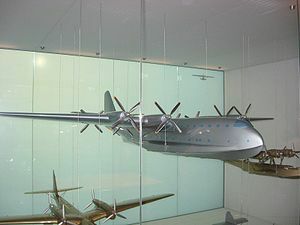 By 1943, it was realized that long-range flying boats were not needed due to the worsening war situation, and the Do 214 project was canceled.